Welcome to your Cat Shop Online, Australia’s #1 leading Online Cat Shop. The only place you need to visit for fabulous products which has been designed specifically for cats! Where we are sure our prices will also be the most competitive in the business. We understand how important it is to get the best value for your money in today’s market and the need to get the best value for you and your pets so we strive to be the best. 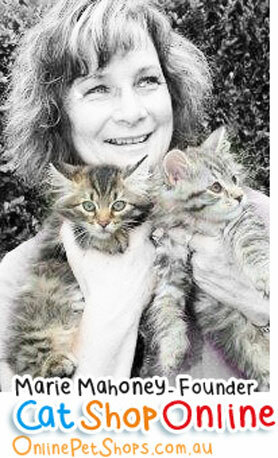 Here at Cat Shop Online after more than 25 years of breeding Birman’s and Siberian’s we have spent many hours researching, testing and trialling cat toys, cat grooming products, cat carriers and cat beds that we know that are the very best you can buy for your special felines, including our new Cat Toy Club! We decided to launch our online shop where we can offer you the benefit of online shopping from our fantastic cat range of products with the knowledge that the toys we have sourced will be a great choice and that your cats will love them as well. The benefits of our CATS ONLY online pet shop is that it’s we are all about offering the best cat products with convenience. We’re open 24 hours a day 7 days a week -your order will be delivered straight to your door! My many years of being involved in every thing to do with cats and my hours of searching the web for products that are great has led to my decision to create our online pet shop. So that I can also bring great products to you, like our amazing range of Cat Beds, all at affordable prices. The are many sites that you can visit here in Australia but they cover all types of pets, here at Cat Shop Online we are all about PRODUCTS FOR CATS ONLY! I have always had an association and an affinity to cats. As a youngster, there was always a cat in the house! I can not remember a time in my life that I have not been around a cat. Twenty five years ago my husband consented to the purchase of my first pedigreed cat a very beautiful seal point Persian Mamselle. This led me to the world of the pedigree cats and so in the last 25 years I have gone on to breed the wonderful Sacred Cat of Burma “The Birman” and more recently the fabulous Siberian Forest Cat of Russia. This journey has also seen me attain my Longhair Judges license with Queensland Feline Association Inc. My Siberian’s and Birman’s over the years of showing and breeding have attained many top awards as have some of our cats that are now owned internationally. The world of showing cats has been a great place to learn about all aspects of the best cat grooming supplies to present your feline in the best possible light if you intend to try and win a place on the show bench or keep your cat looking the very best! I have not only had to learn how to groom and present my Birman’s to perfection but also my Siberian’s. Cat Shampoos for all the different types of coats. For example: Two cats can have very different coats although they are classified as semi long hairs they are different to each other and so grooming process for each breed is handled differently. In the last year I have also had the pleasure of owning a wonderful blue van Persian Cat which have amazing coats for which special care is needed. Cat Products that Truly Delivery Results! The products shown in our Cat Shop Online store will achieve your desired results. Not only are the types of shampoos important but so are the Cat Combs and Brushes we recommend and use! Fine grade Slicker Brushes are great for blow drying and anti static combs for the last minute touch ups on the show floor. Roller toothed combs are great for general grooming and Zoom Groom is my brush of choice for getting the coat out when summer comes around and moulting is taking place. Caring for my cats in the best way possible and also having my cats in great condition and contented is a priority here. So naturally this led me to purchasing and trialling of many toys for fun with our kittens and getting to know which products work the best like many of the products you will find on our Cat Litter Box Accessories page. You can rest assured that any product you see on our site today, are ones that we also currently use in our own cattery… and the toys are ones our furry family love to play with the most!! We are located in Morayfield QLD and we will allow you collect from orders from us, or perhaps you may prefer meet me at one of the cat shows around Brisbane QLD (please contact us for dates and locations). Our Online Pet Shop is open 24 hours a day and we are happy to post your orders to you! On our site you will find many exciting things to entertain you and your felines. If we don’t stock the item you are looking for then please get in touch and we will see if we are able to source it for you. Questions About Your Order? Enquiries?